Not after if to Sydney without stopping in this one Australian landmark. 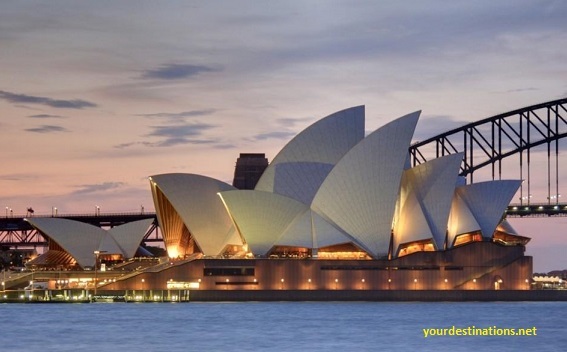 Is Sydney Opera House which is the most famous tourist attractions in Sydney at the same time most visited by tourists from other countries. The opera house that looks like a giant sailboat is located at Bennelong Point on Sydney Harbor. Sydney Opera House is used to perform art and cultural performances. You must take the time to stop by and take pictures at this very interesting tourist spot in Australia. Walking into the Darling Harbor area, you can visit Sea Life Sydney Aquarium. This one aquarium is unique because there are 8 zones in it. In addition, at Sea Life Sydney Aquarium you can see 700 species of animals and 1,300 species of typical Australian fish. As in the Jurassic Seas zone, you can see the ancient sea animals that are still alive today. Then, at Dugong Island we can witness the attraction of the officer who feeds the dugong. Not only that, there is also a Shark Valley zone that has a collection of sharks from various species. Want a cheap shopping trip in Sydney? Or want to just look for a hand for family and friends in the country? Just come to Paddy's Markets in Haymarket (Chinatown) and one in Suburb Flemington. This is a place to buy typical Australian goods at a cheap price. In addition to finding objects and food typical of Australia, in Paddy's Markets, you can also find objects of art typical Aboriginal Tribe, you know. Come on, do not forget to visit Paddy's Markets for hunting a typical souvenir of cheap Australia. Bondi Beach or Bondi Beach is a tourist attraction in Sydney, even in Australia, the most visited by local youth. Not only local youth, tourists from other countries also always take time to relax in this always crowded beach. Bondi Beach offers clean white sand and fine sea and sea with a wave that is not too big. As a result, this beach immediately became a favorite for local people and tourists for a vacation. Around the beach, there are also hotels, cafes, and various kinds of entertainment that pamper the tourists. Hyde Park is Australia's oldest park. The park is located on the east side of Sydney's central business district is still well maintained and very beautiful. Therefore, many local people take long walks, work out, or relax in Hyde Park. Inside the park are an Archibald fountain and ANZAC historical building. What makes Hyde Park even more attractive is the presence of important monuments and statues. The perfect time to visit Hyde Park is in the morning or afternoon because the sun is not too hot. The place formerly called Sydney Wildlife World is located very close to Sea Life Sydney Aquarium. Both are in Darling Harbor. So, you can visit Wild Life Sydney Zoo before or after visiting Sea Life Sydney Aquarium. What makes Wild Life Sydney Zoo different from other zoos in the world is its closed and air-conditioned place. Visitors will walk on a 1-km street and on either side of the road is a cage that is home to 6,000 native Australians. Well, when else can you take a walk in the zoo which is cool and not smelly? Sydney Tower is Sydney's tallest building and second highest in Australia after Q1 is on the Gold Coast. The 309-meter-high tower is indeed open to the public, so as a tourist you can visit this place. Inside the Sydney Tower, there is also a restaurant that offers a dining experience with Sydney City view from a height. In addition, travelers can also buy tickets to the Observation Deck to see the sights of Sydney in a 360-degree angle. Not to mention there is Skywalk for you who want to test the adrenaline by walking around the top of the Sydney Tower on the outside of the tower. This one is a shopping mall in Sydney that is frequented by tourists from various countries. The reason, Westfield Sydney has several stores from world-renowned brands. If you're an original branded person, then you should stop by and shop at Westfield Sydney. As for some of the brand celebrated the opening of stores in this mall is Braun Buffel, Calvin Klein, Chanel, Christian Louboutin, Fendi, Furla, Gap, Givenchy, Gucci, and a number of brands other international. Westfield Sydney is on the Cnr Pitt St Mall and Market St of Sydney NSW 2000. The fourth longest bridge in the world became the last tourist spot visited by tourists. The reason, from this bridge we can enjoy the beautiful scenery and see Sydney Opera House. If you want to enjoy the view from this bridge, you can rent a bicycle and cycling across the widest bridge in the world according to Guinness World Records. Above the Sydney Harbor Bridge, there are railroads, motor vehicles, bicycles, and sidewalks.